Lest you think President’s Day was created to get you 30% off a flat screen TV or two-for-one Egyptian cotton bath towels, check out some of these fun Presidential facts and smart needlepoint designs. History buffs, teachers and professors will appreciate this Founding Fathers needlepoint belt, which features images of James Monroe, John Adams, Thomas Jefferson, Alexander Hamilton, George Washington (Happy Birthday, George! ), Benjamin Franklin, James Madison, John Jay, and Samuel Adams. These politicians, jurists, soldiers, diplomats, statesmen, and ordinary citizens led the American Revolution and helped create the Declaration of Independence. Without them, we would be…well, British. With this belt around your waist, you can be inspired to do great things as well. Contrary to what most people believe, George Washington’s hair was real; however, his hair color was actually reddish-brown, not white. He powdered his hair to get that white look. President’s Day became an official federal holiday in 1760 and was celebrated on February 22 – George Washington’s birthday. In 1971, the Uniform Monday Holiday Act established President’s Day as the third Monday in February, so it would always fall on a Monday. The Act was designed to create more consistent holiday schedules and provide more three-day weekends for the nation’s workers. 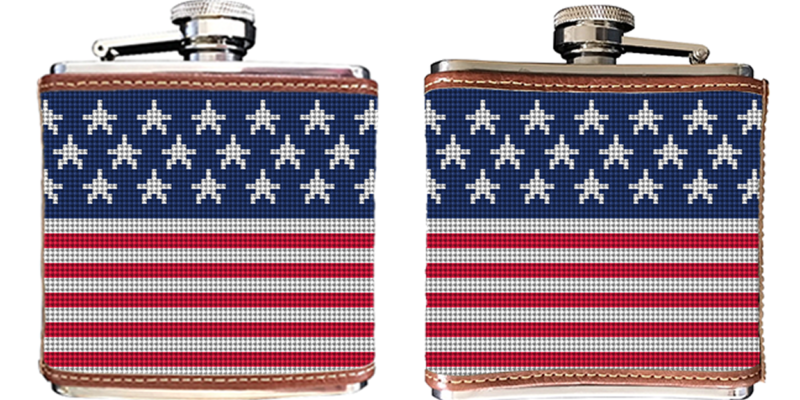 We hope you’re feeling patriot and can live up to these lofty goals while you enjoy your long weekend. 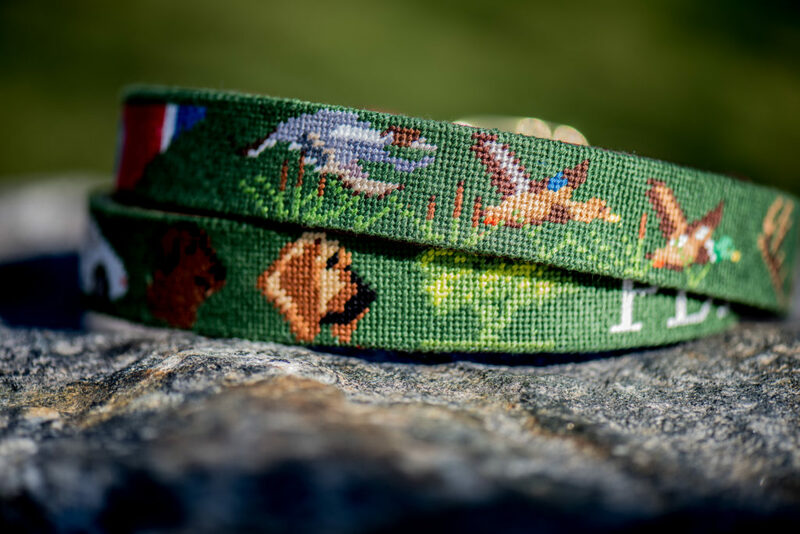 Get your dog in on the action with a custom, American flag needlepoint dog collar. Thomas Jefferson founded the University of Virginia in 1819. The Rotunda on the University of Virginia’s campus is seen as a long lasting symbol of Thomas Jefferson’s belief in the separation of education and the church. Jefferson is the only president to found an institution of higher learning….because we’re not counting Trump University. House your Benjamins in this iconic UVA Needlepoint Wallet. John Adams, who was the first president with a college degree, graduated from Harvard, as did his son and future sixth president John Quincy Adams, Teddy Roosevelt, Franklin D. Roosevelt and John F. Kennedy. Several other presidents attended Harvard for graduate school including Rutherford B. Hayes (law school), Barack Obama (law school), George W. Bush (business school). Whether you’re a current or future alumni (or want to pretend you are), your Harvard University needlepoint belt can be customized with your initials. If Haaa-vad isn’t your alma mater, Brewster Belt company can design a custom campus belt for any college or university. As a young boy, John Adams often skipped school to spend time hunting and fishing. 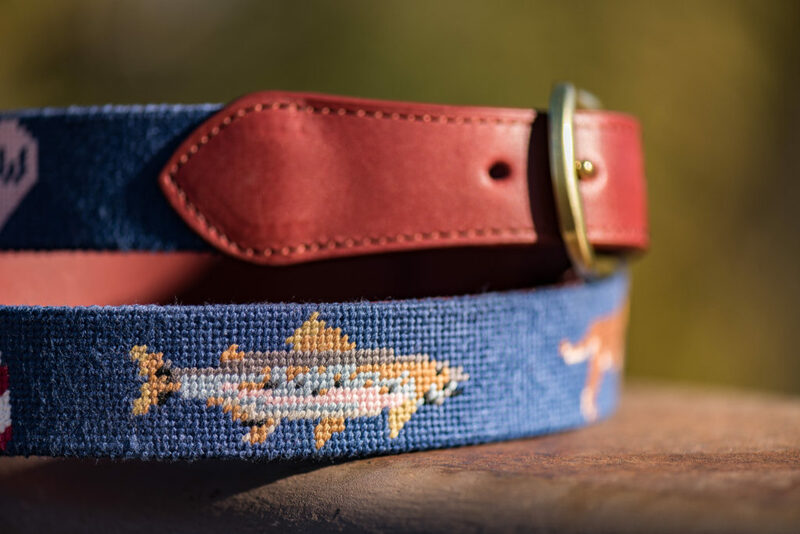 If you’re inspired to pursue your love of hunting or fishing in order to achieve greatness, check out our hunting needlepoint collection and fishing needlepoint collection. Happy President’s Day! Now, get to the mall before the sales end. On this 20th day of 2017, Donald Trump was sworn in as the 45th President of the United States. It was a divisive election and some Americans are hopeful that he will make American great, whether you’re feeling like this…. 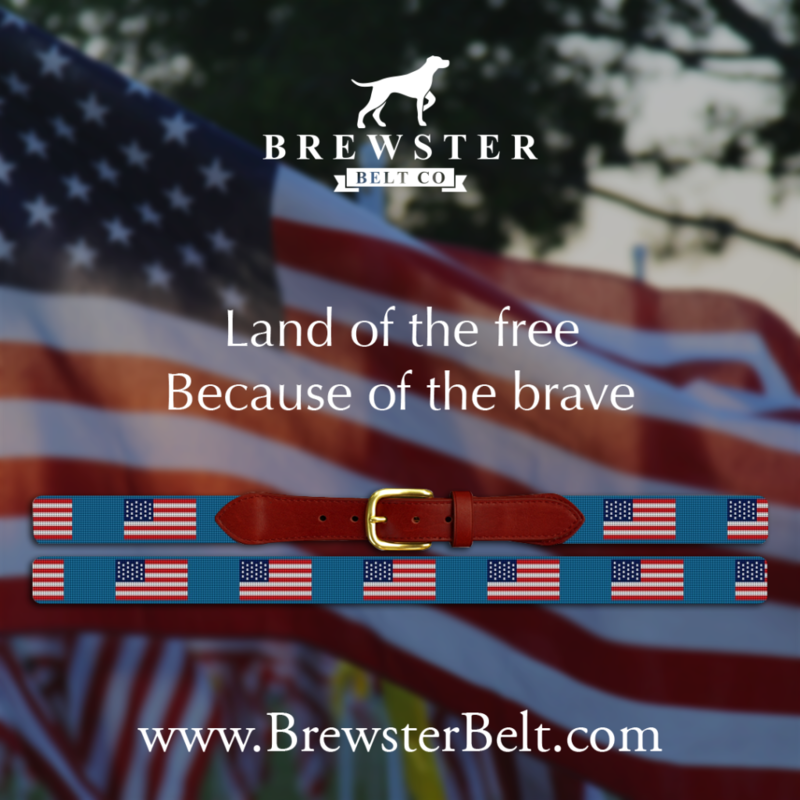 …Brewster Belt Company has the perfect custom needlepoint accessories to help you express yourself. For those of you feeling patriotic, we suggest an American Flag Needlepoint Wallet to safely house the fruits of our future prosperity. 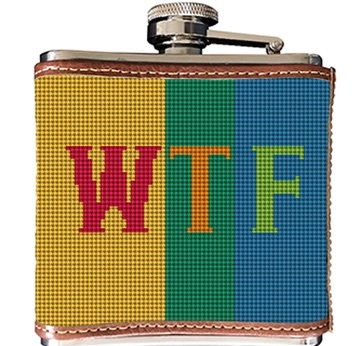 If you’re still trying to process the outcome of the election, you can drown your sorrows in style with this WTF Needlepoint Flask. And, if your dog wants in on the action, an American Flag Needlepoint Dog Collar will do just the trick. All Brewster Belt Company needlepoint accessories are hand-stitched and fully customizable. So, check out our offering and create your own statement.